It is Amelia Earheart's birthday. She is quite relevant in today's world. We have our first female Presidential nominee and the other night Ivanka Trump talked about equality and the importance of women. Well, not only is Ms. Earheart remembered as one of the most celebrated aviators, but also as a symbol of the power, courage and perseverance of women in America, I am so proud to be an American Toy Poodle Woman. And woofs back to you for being and American Woman Golden Retriever! RosyPoodleKisses! Just read your about page and your blog's mission "to create smiles". That is an awesome mission and is similar to ours! Happy Amelia Earhart day. You look like you were really there with her! Yes! We are carrying on our Golden brother Bear's legacy for creating smiles around the world! Isn't it fab to create smiles!!! 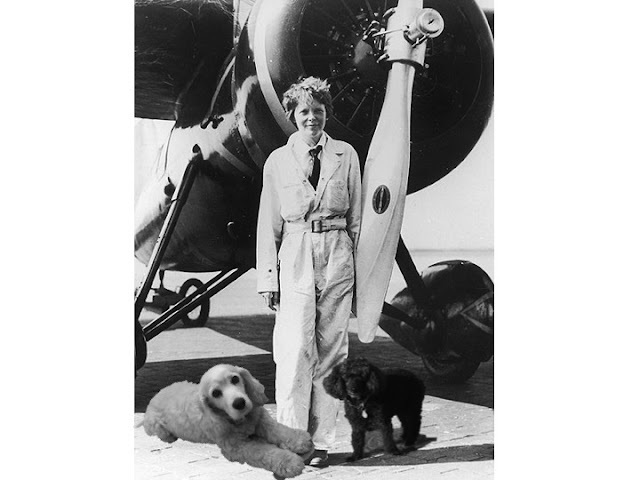 Happy Amelia Earhart Day! RosyPoodleKisses! OMP! Thanks so much!! you are pretty cute your big self ! RosyPoodleKisses! Why thank you so much! So proud!! RosyPoodleKisses! No Tikka , you should get a lot of respect, You are an American Orange Kitty Man ! RosyPoodleKisses!